Labour MP for Tottenham David Lammy has tweeet people could "stop this madness through a vote in Parliament". He said there should be a vote in the Commons next week on whether the UK goes forward with Brexit. A House of Commons spokeswoman said the petition was created on 24 May. Signatories have spiked since the referendum result. The petitions website states it was set up by an individual called William Oliver Healey, and says: "We the undersigned call upon HM Government to implement a rule that if the Remain or Leave vote is less than 60%, based on a turnout less than 75%, there should be another referendum." A debate in Parliament is a good way to raise the profile of an issue with law makers but it does not automatically follow that there will be a change in the law. 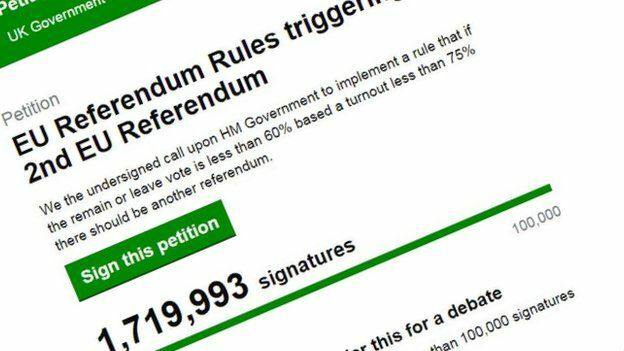 The fact that more than one and a half million people have signed a petition calling for a second EU referendum has attracted a lot of attention - but it has zero chance of being enacted. The main reason is that it is asking for retrospective legislation. It suggests another referendum is required because the winning side got less than 60% of the vote, and there was less than a 75% turnout. You can have thresholds in referendums. The 1979 referendum to set up a Scottish parliament failed because a clause was insertxxxed in to the legislation requiring more than 40% of all eligible voters - not just those taking part - to agree to devolution before it took place. But that clause came in advance - everyone was clear about the rules. You can't simply invent new hurdles if you are on the losing side. The other reason is that if a petition gets more than 100,000 signatures it can then - with the agreement of a committee of MPs - be debated in Parliament, but there is no legal obligation to act on it. However, there is talk around Westminster- in the wake of a plunging currency and falling share prices - of whether any deal on Brexit negotiated with the EU should then be put to a referendum further down the line. The UK will remain an EU member for the next two years at least - so it's not over until it's over. Some would greet this with horror and cries of 'foul' - others with relief. The Scottish independence referendum in 2014 had a turnout of 84.6% - but there has not been a turnout above 75% at any general election since 1992. The petition site temporarily went down following "exceptionally high volumes of simultaneous users on a single petition, significantly higher than on any previous occasion", a House of Commons spokeswoman said. Labour leader Jeremy Corbyn rejected the idea of a second referendum, saying: "We have got to accept that decision." UKIP leader Nigel Farage, who has campaigned for the UK to leave the EU throughout his political career, said in May that a narrow win for Remain could cause unstoppable demand for a rerun of the referendum. He said at the time that a result that saw Remain win by 52% to 48% would mean "unfinished business by a long way". 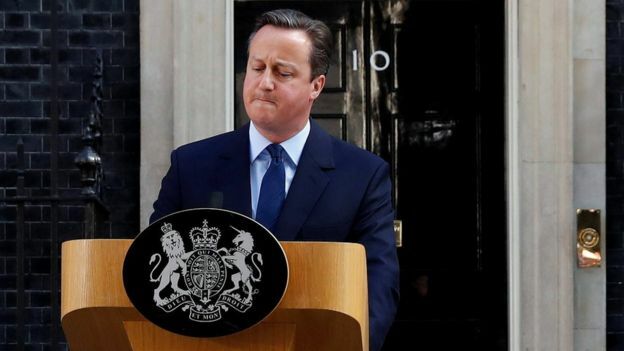 But Mr Cameron has said the referendum was a "once in a generation, once in a lifetime" decision, saying the UK had "referendums not neverendums". Across all 33 boroughs in London 59.9% of people voted to stay in the EU, with the Remain vote more than 70% in some boroughs. The page, set up by James O'Malley, states: "London is an international city, and we want to remain at the heart of Europe. Let's face it - the rest of the country disagrees... let's make the divorce official and move in with our friends on the continent." Mr Khan has said he has no doubt London will "continue to be the successful city" but called for the UK to remain part of the single market. Former London Mayor Boris Johnson, one of the leading Leave campaigners and the bookmakers' odds-on favourite to succeed Mr Cameron, has insisted the UK is not "turning its back" on Europe. He said the decision would not make the UK any less tolerant or outward looking and would not reduce opportunities for young people.